From product specification to installation, our team coordinates every aspect of your project while adhering to your budget and deadlines. We know how important it is to meet the strict demands of facility owners for quality and service, so we recommend only the best manufacturers for the job. We guarantee your carpet cleaning experience will be a breeze. We offer pet and smoke odor treatment, upholstery cleaning, grout cleaning and Scotchgard™ protector. Scheduling an appointment online is simple! Use this link to access residential and multifamily carpet cleaning and installation appointment forms. Multi-Family Flooring has been one of our best subcontractors for years now. Tony and his staff are dedicated to 110% customer satisfaction and are the most responsive company that we deal with, which is a refreshing change from the norm in the construction industry. We have worked with all of their installers and every one of them is very professional and have great attention to detail on every flooring job. 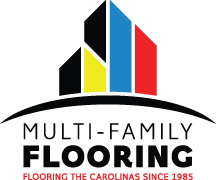 We have done over $260,000.00 with Multi-Family Flooring and look forward to partnering up with them on many many more successful jobs in both the commercial and residential construction projects that we have here in the Lowcountry of SC.